The recent publication of The Fall of Arthur is one such example: a 1000-verse poem that remains incomplete. Undoubtedly, this work is a pristine example of Tolkien’s incredible mastery of the Old English alliterative metre. As it stands however, this piece lacks the proper ending to an otherwise powerful, engaging and promising epic, demonstrating the author’s skills both as a storyteller and a poet. Thankfully, in his son’s commentaries which accompany the book, we are provided with a wealth of drafts and sketches – some in verse form, others as short notes – on how the poem was planned to proceed: including the scene of the actual fall of King Arthur in the story. There are at least a hundred or so verses sketched out, which continue the journey of Arthur as he is mortally wounded by Mordred. ‘Completing The Fall of Arthur‘ is an initiative undertaken by a devoted fan of this work (me! ), willing to see the poem in its finished form – the way Tolkien had originally intended to. This project hopes to bring on board like-minded individuals in an attempt to construct the rest of the poem, based on Tolkien’s own notes. By implementing the already existent draft verses, contributions – written in the same metric style and following Tolkien’s intended storyline – will be included with the original work as a proposed continuation. 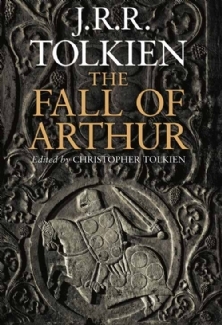 It is ultimately a work of “fan fiction” – where devoted readers create their own stories based on an established storyline – but in the case of The Fall of Arthur, that storyline is already available. It is up to us to turn those notes in an alliterative metre style worthy of Tolkien himself! We’re not trying to compete or match the writing prowess of Tolkien here (if that is even possible). The completed second half of the collaborative verses will be made available online for readers who wish to explore a possible scenario where the whole poem is complete. This is an entirely voluntary project, not intended at producing any profit whatsoever; but aimed to engage together as a community of fans in order to attempt to see a complete poem. I shall be posting updates on this blog under the ‘Projects’ section. A foolish attempt? Most likely. But there’s something quite special in this poem, and it deserves to be seen on the same level as Tolkien’s other (more popular) works. I love this but need a copy of The Fall of Arthur first 🙂 . Excellent Idea James, Never thought to finish any of the professors works. This is a large initiative indeed. I wish you all good luck and am looking forward to the results! What a fun project! I’m not sure if you’re still looking for contributors, but I’d love to attempt to fit in with Tolkien’s style, if only as a way to cultivate an even greater appreciation for his poetic talents!